Attacking Russia in the winter is just a poor, poor idea. But even before those notable examples, we must look at Charles XII of Sweden. 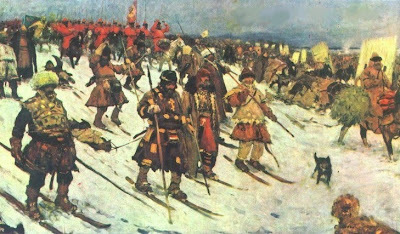 He braved General Winter's devastating conditions to attack Peter the Great's empire in 1707. He just happened to chose the worst winter of the 18th century, when even the salt water port in Venice froze solid. Only 19,000 Swedish troops remained by the end of Charles's disastrous campaign, effectively ending Sweden's turn as a military power. Napoleon decided he could do it better. His Grande Armée, numbering 610,000 men, launched the French invasion of Russian in June of 1812, and actually managed to get as far as Moscow. Soldiers entered the city and began looting, the culmination of which was the Great Fire of Moscow in 1812. But by then, only one-third of all Moscow residents remained; they'd fled well in advance of the French invasion, in preparation for a swift counterattack. The weather only came into play after the capture of Moscow. Napoleon learned of an attempted coup back in France and rushed home, leaving his generals to cope in a city devoid of resources and a scorched-earth landscape that offered no grass for cavalry horses. Eventually, as the snows began to fall, those horses became food and the army retreated. The following graphic by statistician Charles Minard shows the extent of these losses: the beige color represents the forces entering Russia, while the black line represents the Grande Armée's diminishing strength as it fled. Click and take a look--it's very interesting, especially the temperatures listed along the bottom during the French retreat. Some eyewitness reports, however, have starving Frenchmen surrendering even before the onset of winter. Supply lines, not necessarily General Winter, may have been more crippling. The French embarrassment over their failure in Russian may have prompted claims that the weather was to blame because, in fact, the winter of 1812-13 was relatively mild. But the devastating losses--more than one million civilians and more than 700,000 military casualties--and the harsh lessons regarding supply lines and the weather did not deter Hitler during World War II. The Eastern Front in the European Theater of Operations is still referred to by Russians as "The Great Patriotic War," because they viewed the conflict as a do-or-die struggle for their sovereignty and fought accordingly. The German army's Operation Barbarossa, conducted between June and December of 1941, claimed more than one million dead and over three million injured. The invading forces could see the spires of the Kremlin in Moscow when the first blizzards hit. They advanced no farther. The connection between Napoleon's hubris and that of Hitler was not lost among his men. One German general noted in his diary: "They remembered what happened to Napoleon's Army. Most of them began to re-read Caulaincourt's grim account of 1812 ["With Napoleon in Russia"]. That had a weighty influence at this critical time in 1941. I can still see Von Kluge trudging through the mud from his sleeping quarters to his office and standing before the map with Caulaincourt's book in his hand." The Soviet counter-attack did not wait for spring. 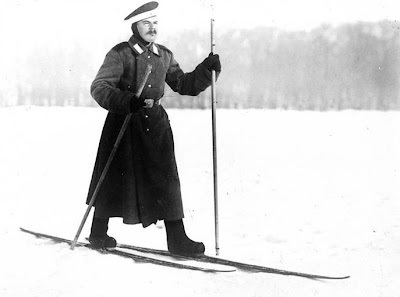 Instead they launched their ski-clad armies westward in January, splitting the German front. The following winter, when the German 6th Army surrounded Stalingrad in a deadly, months-long siege, other panzer divisions tried to reinforce the offensive but stopped only 40 miles short. The siege ended with the Germans in retreat. In January of 1944, convinced that the Red Army must be on its last legs, Hitler ordered his men to hold the Dnieper line--the last line of defense between Germany and Russian territories. But the Russians liberated Odessa and Sevastopol by spring. After that, the Russian forces would not be limited to defensive strategies and sieges, but continued aggressive offenses no matter the conditions. For example, they entered Warsaw in January 1945. I think this is where we must end with a famous quote from The Princess Bride, where Vizzini said to Westley: "You fool! You fell victim to one of the classic blunders, the most famous of which is never get involved in a land war in Asia." And certainly never attack the Russians in winter!